Updates, new comics, and announcements can be found here. Mostly comics though. 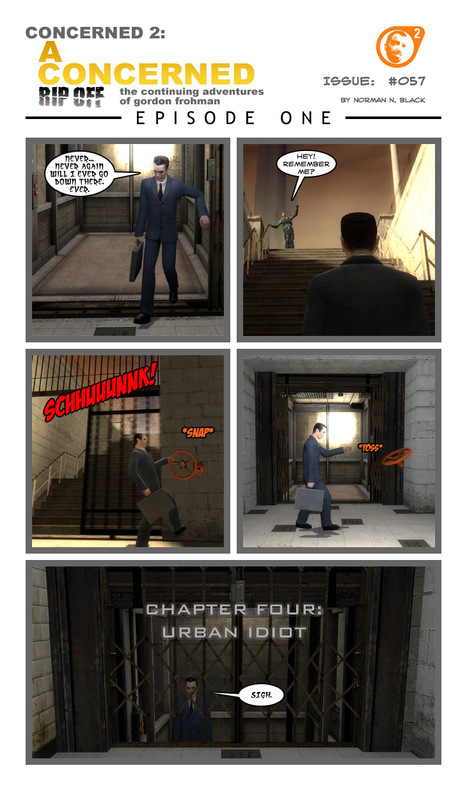 So here we are at another comic. Enjoy! Frohman and grenades do not mix well. Actually, I'm not sure if anything mixes well with Frohman. 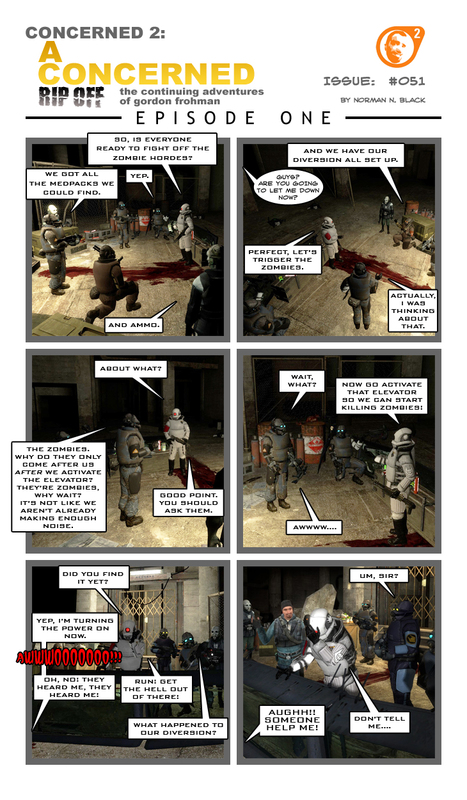 And the comic rises from the dead like the unholy abomination that it is! This should have been out a long time ago, but there was a series of events that severely delayed for the entire summer. My first "excuse" was that my computer died. I was upgrading something, and it took about a month for me to figure out the problem and finally get it fixed. And just when you thought it was over it comes back like a bad rash that you thought you took care of with all those medications you spent hundreds of dollars on. I don't really know why I didn't update in so long. I'm just really lazy. So because of the lack of updates recently, I decided to try to make it upto your guys by posting another comic on the same week. Such an act has beenunheard of and will spawn many legends about how this site once was updated sofrequently in one week that the universe almost imploded, requiring ChuckNorris to save the very fabric of space-time from tearing apart. I wasn't very pleased with the way this one came out. There isn't areal punch line, but I needed to release something seeing as how it's been afew weeks since the last comic. I know I said that I would try to get the comics out regularly a while back, and I'm still trying to do that. The only problem is that my computer doesn't always want to cooperate. 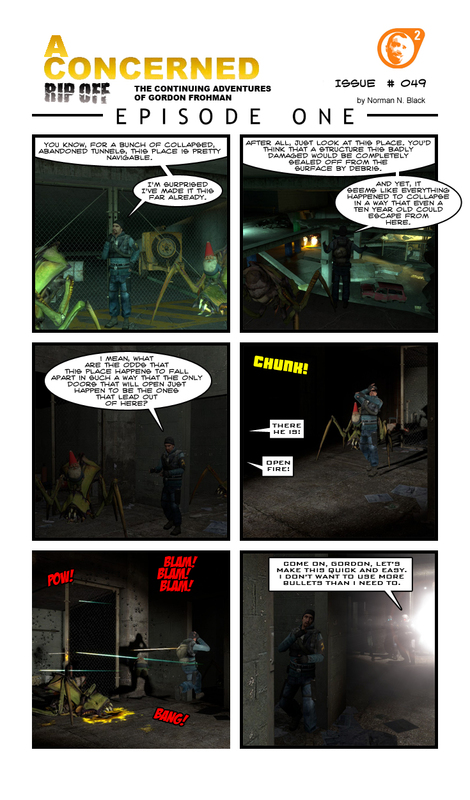 I probably could have not added any sound effects to this one and it would still be understandable... well except for the running out of ammo part. 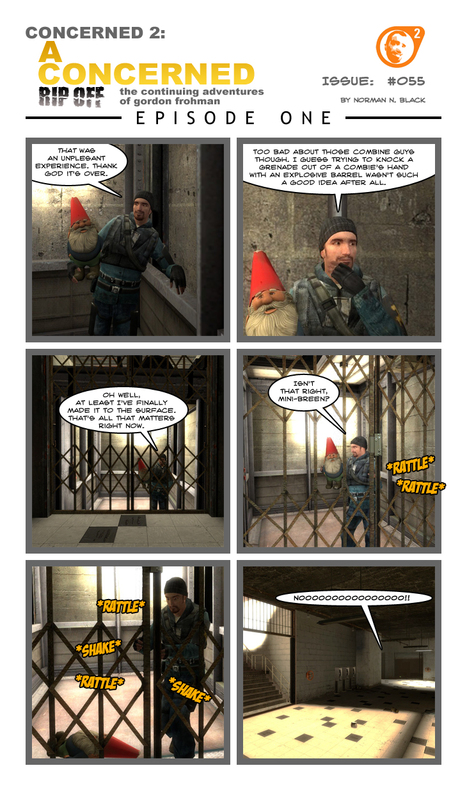 I wish you could have used that Gnome as a melee weapon in Episode 2 like you could in Left 4 Dead 2. Strangely enough, the abbreviation for Left 4 Dead 2 sounds like it would be the name of an astromech droid from Star Wars: L4-D2. Sorry about the lack of updates. I don't really have any excuse this time. Hopefully I'll get back to updating weekly like I'm supposed to. I apologize for the lack of comics recently, but the webhost has been having some problems related to the sidebars. I had to disable them in order to edit the site properly. At long last issue 51 is here. Hello, and sorry about the lack of updates (again). Sorry there's no new comic this week, but instead there’s something that a lot of you have been asking for. Finally, my 50th comic. Here's to 50 more and beyond without Chris suing me! I'm not sure how popular "Concerned" was at its 50th comic because I didn't find out about it until after it was finished, but I'm sure it fared better than my rip-off. I blame it on the first several comics. I need to redo those. Sorry for the delay on this one. More computer trouble. One of my graphics cards died and it took me a while to figure out it wasn't a driver issue. 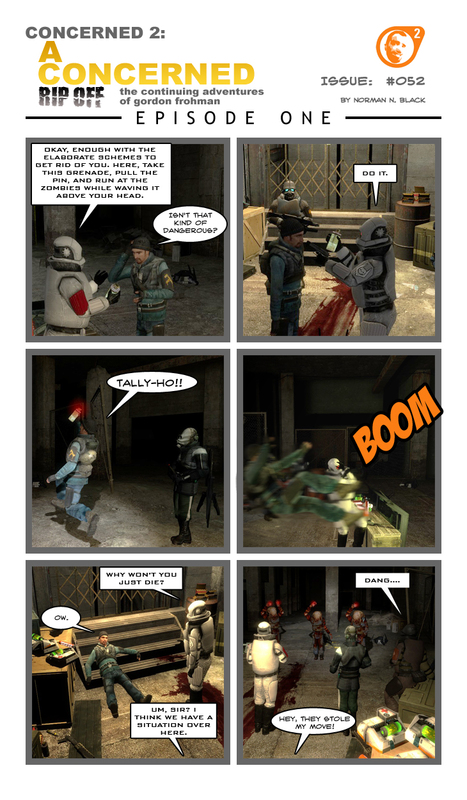 Anyway, here's the comic.